Peeps are marshmallow candies, sold in the United States and Canada, that are shaped into chicks, bunnies, and other animals. There are also different shapes used for various holidays. Peeps are used primarily to fill Easter baskets, though recent ad campaigns tout the candy as “Peeps – Always in Season”. They are made from marshmallow, corn syrup, gelatin, and carnauba wax. 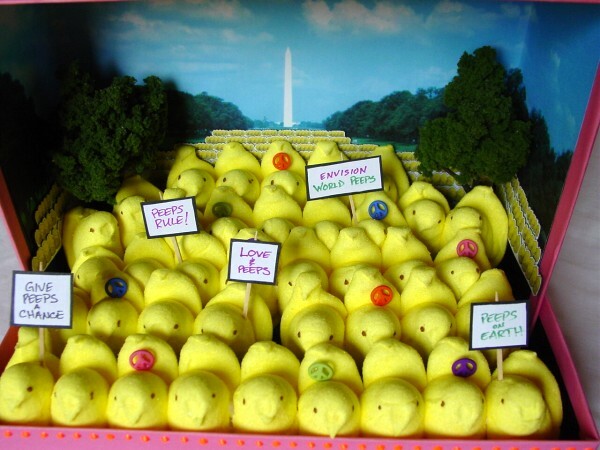 Peeps are produced by Just Born, a candy manufacturer founded in Bethlehem, Pennsylvania by Russian immigrant Sam Born. In 1953, Just Born acquired the Rodda Candy Company and its marshmallow chick line, then turned the tedious process of hand-forming the chicks to mass production. The yellow chicks were the original form of the candy — hence their name — but then the company introduced other colors and, eventually, the myriad shapes in which they are now produced. No Peeps in Oz? Tragic!! We should write to the makers immediately!